The only reason it is a tough economy for ads is that most advertising is not targeted correctly. Many pay per click engines are intentionally selling poor quality traffic. That traffic does not generate any sales. When advertising doesn’t convert eventually advertisers WILL quit buying it! 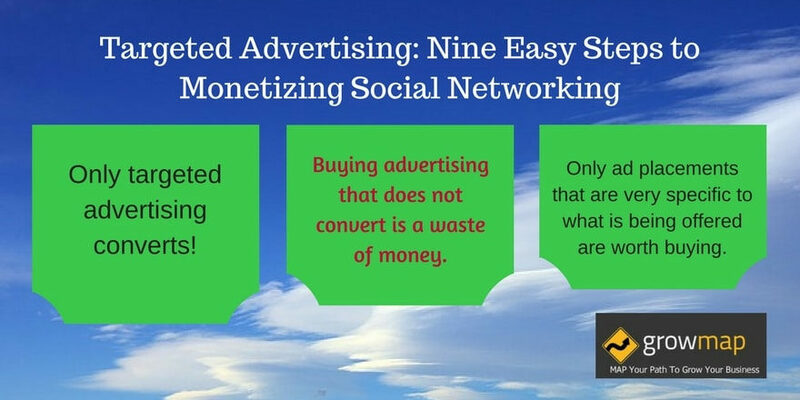 Buying advertising that does not convert is a waste of money. Therefore, only offer ad placements that are very specific to what is being offered. Am I the only one who sees the elephant in the room when it comes to monetizing any Social Networking site? StumbleUpon almost stumbled upon it but eliminated it when they got bought out. The big money is in advertising. The REASON it converts is that it is RELEVANT to those who see it. SOLUTION: Use data mining to pull existing activity into pages targeted to specific niches. Provide an easy way for your users to get to that niche information. Offer advertisers ads that appear ONLY on the specific pages most related to what they want to advertise. WIN ONE: Users get to find out about products and services related to their favorite interests. WIN TWO: Advertisers get to reach those who are most likely to buy from them. WIN THREE: Social Networking services become as profitable as Google AdWords. Using a combination of algorithms, tags, data mining, and allowing trusted users to edit incorrectly placed information while they’re using the site could be implemented. Social Networking sites can start offering what all businesses want and need: a way to reach their potential buyers while STILL providing their users with a quality experience BECAUSE people do NOT mind advertising they’re interested in – only advertising they do NOT want to see! Everyone hates to be SPAMMED. Everyone hates “junk” mail which they define as anything they’re not interested in. Products and services related to what we love doing are not considered SPAM or JUNK. The reason it takes so long to get minimal benefit from Social Networking is that none of the popular Social Media sites are providing content in an easily usable form. StumbleUpon almost did it right before they were acquired and then got rid of the most valuable content they had! What SU had was pages based on keyword tags. Each tag had a page that showed the most popular shared sites for that tag based on clicks, reviews, and readers voting them up. It also showed the users who shared the most valuable content on that subject. IF you knew how to get to those pages (it wasn’t that obvious) you could quickly and easily find the most knowledgeable users on that subject. Say you had questions about Ubuntu – you could go to the Ubuntu page and find the most valuable resources about it AND connect with someone who could answer specific questions. THAT is what Social Networking is missing. Yes, there are search functions at Twitter and other social networks but that is not nearly as useful as using the power of computers to organize and present content in an easy to use way. The first Social Media site that finally gets that right will require far less time and give far more back! When they do they will not only be an awesome resource for users – they will also provide what every small business needs and what will be their Golden Goose of monetization – a highly targeted niche audience. Ads there will convert and advertisers will line up to buy them. This is precisely how Google makes most of their money and how these sites should too! Post originally published Jan 27, 2009. Updated Jan 14, 2017. Interesting topic since it involves all of us and we’re all looking for monetizing. I strongly agree with the three win win situations discussed in the article. The users definitely have more options and at the same time helpful in narrowing the options of choosing the best service. advertising if done the RIGHT will will yield positive as well a good money. this post has a lot of great ideas. Good article. I agree with you that the most important thing is that an offer is targeted to a potential buyer. There’s absolutely no good in sending 1 million visitors to a page if they are absolutely not interesting in the product. If people are able to target their customers well then conversions will increase and their entire advertising campaign will have more chance of success. .-= Joey @ Kids Iron Man costume´s featured blog ..Privacy =-. This is a nice blog with very informative articles! Thanks for sharing the ideas. I learned a lot from here. Anyway, just to share on one of the most overlooked ways to drive traffic to your website. Try offline advertising. For example, I’ve had great luck with postcards, display ads, classified ads and recently radio advertising, which I am finding very interesting for driving qualified leads to my business. Even today they still are not targeting their advertising or making it easy for Internet users to locate what they are most interested in. .-= GrowMap @ Social Media Marketing´s last blog ..Best to All in This Happy New Year of 2010 =-. .-= ronan@luxury travel´s last blog .."The Beach Boys of Yenagoa" by Pelu Awofeso =-. I agree that as Social Media sites are currently structured that advertising on them is never going to be as effective as search. There is no reason, though, that they can not provide their own search function along with their own ads. When you can easily search for and find recommendations and reviews from your peers on Social Networking sites and advertisers can position their ads on the results of those searches in exactly the same way AdWords works today users will stay on their favorite Social Networking site instead of switching to a search engine. There is also one kind of contextual ad that can convert even better than search. That is placing ads for a specific product next to a review or recommendation of that specific product – especially when it is is new and not widely available or it is being heavily advertised. .-= Internet Strategist @GrowMap´s last blog ..Are You Playing Hide and Seek With Your Market? =-. I also believe that advertisements should be relevant to the audience, otherwise they will be ignored and annoy visitors. However, we have noticed that adverts don’t perform well on forum, they tend to be ignored, people are reading topics, write replies, but they are not very interested in adverts. Ads displayed in forums would be considered content ads and those will never convert as well as search ads. In the first case you get curiosity clicks and in the second someone is actively searching for a specific product or service. They could convert well IF the topic being discussed in the forum is how to buy something or what specific solutions are most viable AND the ads were displayed in the thread, triggered by a system that uses semantic search to insert related ads at the appropriate points in the discussion. I have not yet seen a system like that; however, I have recently seen a semantic search called TipTop that pulls accurate related information from Twitter. What forums, blogs, and Social Networks must do is create optimum opportunities for adds. For example, they could write posts announcing new products in their niche and feature ads for that product within or in close proximity to those posts. That will convert well – possibly even at a higher rate than search. .-= Internet Strategist @GrowMap´s last blog ..How to Add Your Free Business Listing to infoUSA =-. I have a sort of commercial website but I don’t do advertising despite that a number of companies have asked me to consider banners and so on. I want content, not adverts so I have a Newsgator widget that ties content to a linked logo. Totally democratic because position depends on the freshness of the content. Seems to work, no cost pressure, no renewal pressure. I’m really glad you use Zemanta so the incoming link from one of my post could lead me to your blog. Even though we’re both active at Twitter and FriendFeed I had not come across your work before. What I’m suggesting in this post fits Social Networking sites – especially those with large amounts of user-generated content. StumbleUpon has or had pages that contained the best of on every tag and featured the users most active on that topic. They did not have ads but if they added highly relevant ads users would benefit as would merchants. For sites like yours or mine I prefer to control what gets displayed and only accept advertising from companies I can personally recommend, especially small businesses. Thank you for telling me about NewsGator widgets. I will research them further. My first question would be is the income they can generate worth giving up control and that much prime real estate. @Jerry The sad thing is that before Google’s expanded broad match was changed it worked – and very well. The ads were specific to the search. Now they aren’t. Adjusting the prices because their system no longer displays relevant ads is small consolation for the user who can no longer find what they’re seeking and especially for the merchant who can no longer reaches potential buyers. You could be very interested in my latest two posts about ppc and drops in organic search traffic. I linked the one I think you would be most interested in to this comment. @Jerry I encourage bloggers and merchants alike to diversify their traffic away from Google and AdWords. Having the majority of your sales dependent on one source is a good way to go out of business quickly. Google used to do a much better job of targeting ads than they do now – by design. Anyone using AdWords needs to get VERY serious about generating sales from other sources. That’s definitely true. Targeted ads work, untargeted ones don’t. That’s why Google uses smart pricing, because advertisers aren’t going to keep paying for Adwords if they have to pay the same for window shoppers as they do for people actually interested in their products. Good post, and I’m glad you clearly marked the difference between the two. @Kevin Thank you for taking the time to comment. It is important that those who advertise and those who publish advertising start understanding that only targeted ads work. Funny you should mention lingerie as that is one of the very worst products for those buying pay per click advertising – the clicks from voyeurs far exceed those from buyers! @Ashinque Thank you. I hope you’ll find much more here that is useful to you. @computer repair We can all hope the Social Networking sites will get it figured out. I’d like to hear more about sites giving users a percentage of the advertising revenue. @shireen It doesn’t currently convert well because the advertising is not relevant to the content. Social networking ads will not convert as well as search unless they are VERY targeted. @tam Glad you stopped by. I hope you’ll be back to read about using Social Networking to increase your site’s visibility and to share some tips on what works for you – and often just as important – what doesn’t. Thanks, been looking into using social media more and you’ve given me some really useful tips. Interesting stuff. This is my first time to your blog and really find this blog worth and thank you very much for the informative post. @Joan Thank you for visiting. Targeted advertising is exactly how Google makes the lion’s share of their money and it will certainly work for Social Networking sites. The only question is why they’re not already doing it. @oan Yes, many do use multiple social networking accounts – especially serious bloggers, PR Reps, and Social Media consultants. If more than one Social Media companies started offering niche advertising that would be even better – better for the end users and better for the companies desiring to advertise. A lot of people have several number of social networking accounts, from young to old with varied interests. This concept is quite good and shall I say very effective too coz in this way you already have directed the ads to specific types of users that have high possibility of checking out the products since it matches their interests. @Marc I’m not using Facebook so I can’t really say. I do know that Google was selling worthless ppc impressions on MySpace to unsuspecting advertisers – worthless because their ads appeared when users searched for other users, music, videos and all kinds of other unrelated items. I have seen complaints about their advertising not responding to direct input from users regarding what ads they did NOT want to see. I have serious issues with the amount of private information sites are compiling about us especially when it is totally unnecessary to targeting ads. I believe ad targeting is an excuse they’re using not the true reason. If any site wants to target advertising all they have to do is match the ads to the content. Instead of using data mining to profile us they should use it to create quality content we want to read and reference and place ads within that content. @Dennis From an advertisers’ viewpoint I would gladly pay for clicks from your friend because he was truly interested in what I was advertising and very likely to tell others about it. Anyone with a site about my product is highly likely to be my potential buyer. I argued as much publicly: that Google should consider the INTENT of the clicks and un-ban those who were actually interested. It is easy to tell those from someone who was perpetrating fraud to increase their AdSense earnings. I’m not familiar with Entrecard. Will have to check it out when I have more time. I knew someone that got banned from adsense just as you described – not fraud but genuinely interested…a lot. You’re right though, most networks have no clue. Entrecard seems to do OK with their advertising though. Dennis Edell’s last blog post..Banners Ads or Text Links? Would you say that Facebook is on the right path when it comes to offering targeted advertising – with the amount of information that they have with respect to demographics and interests, you would think that they would/should be able a more targeted advertising solution, right? @Mel Thank you so much for your comment. Even though most complain about advertising, when it is something we’re interested we’ll click on it. Many AdSense users got banned for clicking on ads they were truly interested in when they appeared on their own sites! While having algorithms decide what is relevant is always challenging it can and has been done. Couple that with allowing trusted users to re-categorize misplaced items (which StumbleUpon also used to do) and properly targeting ads is definitely doable. The only thing that amazes me is that none of the Social Media sites are doing it right yet – and few other sites are either!